For Madison Throws Club athletes working hard in the off-season has paid big dividends early this season. 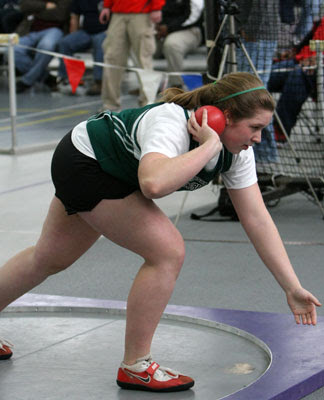 Senior, Emily Franz from Madison Memorial won the Madison All-City Indoor Meet with a new P.R. 37'3.5". 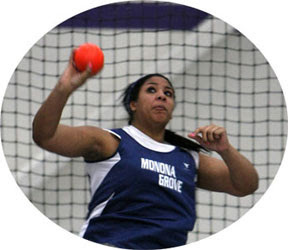 Angela Boushea also a senior, from Monona Grove started where she left off last season....She won the Shot Put at the Nelson Daniels Classic by throwing over 44' in the shot. 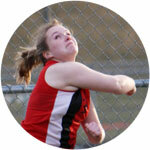 Sophomore, Heather Clankie from Brodhead got the outdoor season going with a Discus win, throwing 123' 6". Theron Bauman, Sophomore, from Monona Grove is off to a great start in the shot put. He threw a P.R. 53'2" at the Nelson Daniels Classic. Senior, Ed Kluender from Madison Memorial won the Boys Shot put at the Madison All-City Indoor meet. THERE WERE SOME GREAT THROWS LAST WEEK! I saw some really nice distances from MTC athletes and Clinic athletes! Congratulations to you all. If you didn't open the way you would have liked, go back to work this week in practice and do the work necessary to get better next week. There's a long way to go until May and lots of work to still be done. Many of you have your first meet of the season this weekend...GOOD LUCK! Its an exciting time of the year when you finally get to go out and get some throws that count. Go out there and have some big throws. Just remember its all about throwing your best at the end of the season. THANK YOU LUKE SULLIVAN for coming back to Wisconsin each year and sharing your knowledge of the throws with high school throwers. You are a great ambassador of throwing. The All-American Throwing Clinic is a wonderful tradition. Thanks for everything. A special thanks to Monona Grove throws coach Brian Storms and Madison Throws Club Alumnist - Jenna Mahaffey for bringing all of your energy and insight to our throwers this winter. Best of luck to everyone this season. I hope to see you at Luke's All American Throws Clinic and/or this summer at MADISON THROWS CLUB.